Here you have it! A tall, modern looking arrangement designed in a cube with carnations, mini carnations spray roses and assorted greens. WOW! Meet Sprouting Happiness, a masculine version of the Flying Butterfly Arrangement. 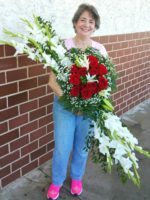 Because we are a real local flower shop, we can take a fun arrangement like the Flying Butterfly and custom design it to meet your needs. In this case, our sender asked for it to be designed for her uncle, which we did. So, here you have it! 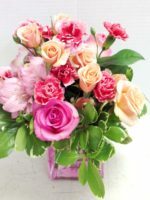 A tall, modern looking arrangement designed in a cube with carnations, mini carnations spray roses and assorted greens. WOW! 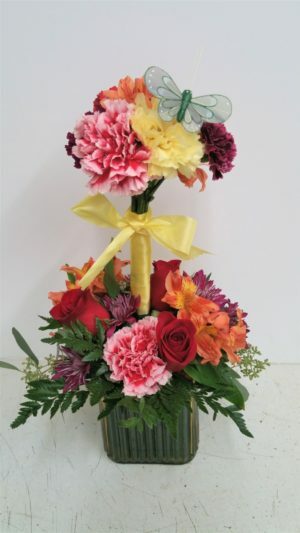 A masculine version of the Flying Butterfly, this custom designed floral arrangement is perfect for the man in your life. 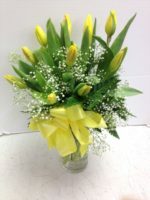 You’ll find this is a great arrangement for a table or desk. Perfect for Boss’s Day, Father’s Day, Grandparent’s Day, Graduation, Get Well or a Birthday, we know this is the perfect sentiment for you.